The popularity of manga continues to grow, inspiring interest in learning how to draw in this exciting style of comics. Comic illustration Studio Joso has created the ultimate guide - 384 pages of manga instruction. "The Monster Book of Manga" is divided into sections focusing on the most popular figures and themes Girls, Boys, Samurais, Monsters, and more. Each illustration is broken down into six stages accompanied by step by-step instructions, taking the artist from initial black-and-white sketches to the final colour piece. They are all accompanied by practical suggestions, hints, and tips. 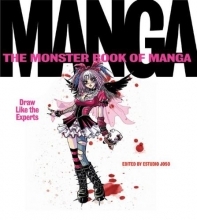 From beginner to advanced, this is the most complete how-to-draw manga book available.